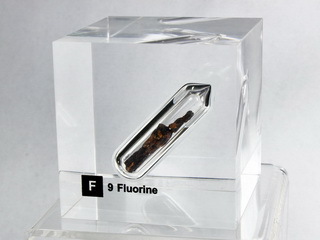 Fluorine salts, known as fluorides, were used for centuries in welding metals and for frosting glass before the element itself was isolated. Fluorine gas is the most reactive of all the elements and quickly attacks all metals - steel wool bursts into flames when exposed to it! Fluorine is used to make uranium hexafluoride, needed by the nuclear power industry, and sulfur hexafluoride insulating gas for high-power electricity transformers, and to treat polythene to make it impermeable to solvents. Fluoride is an essential ion for animals, strengthening teeth and bones. It is added to drinking water in some areas and to toothpaste. The average human body contains about 3 milligrams; too much fluoride is toxic.